The journey began with a long flight from California to Winnipeg, overnight at an airport motel, then a three-plus-hour flight to the western shore of Hudson Bay. After the Cessna Grand Caravan landed on the dirt strip, it didn't take long to unload the gear and jump on the quad for the five-minute ride to the lodge. We settled into our rooms, had lunch, and then headed to the nearby tundra flats for an afternoon hunt. The afternoon shoot yielded four Canada geese but the snow geese that compelled me to travel nearly 3,000 miles eluded us. The next morning, a jolting wake-up call came at 5 a.m. and I rolled out of bed wondering if our luck would improve. After a hearty breakfast, several steaming cups of coffee and a short ride to the blinds, it all seemed worthwhile when the first snows headed in our direction. We crouched low in the blind and went to work on our calls. To our disappointment the birds followed the coastline and completely ignored our calling and decoys. Ten minutes later I spotted a dozen birds heading our way. When the geese were 200 yards out, my hunting partner Carl Rey and I increased the volume on our calls and pulled the birds to the decoys. By the time they passed over the farthest decoy the snows were only 20 yards above the tundra. The birds were directly overhead when I yelled, "Take 'em!" We rose in unison to birds with wings cupped and feet hanging. I blocked out a dark form with a white head and pulled the trigger then switched to a back-pedaling snow as the first bird plummeted to the ground. Carl dropped a pair as well. That was only the beginning of a successful snow goose hunt last September where the Kaskattama Delta meets Hudson Bay. My odyssey began the previous spring during my quest to photograph every species of waterfowl in North America for a book I was writing. Because snow geese are found in all four flyways and the fact that the mid-continent population of lesser snow geese has increased dramatically in recent years, it was imperative that I travel to the Arctic to photograph snow geese on their breeding grounds. My second trip was in September to hunt the snows in the same general area. In North America, there are three species collectively referred to as white geese. They include the Ross's goose, the greater snow goose and the lesser snow goose. Each species occurs in distinct breeding populations across the Canadian Arctic and sub-Arctic. Even though populations of all three species have increased in recent years, it is the mid-continent population of lesser snow geese that has raised the most concern. The birds nest along the southern and western shores of Hudson Bay, James Bay and Southampton and Baffin Islands. Historically these birds migrated south along the Mississippi and Central Flyways wintering in the coastal regions of Texas and Louisiana. While they are still found in these areas, they also winter in Arkansas, Mississippi and Tennessee. Current estimates put the mid-continent population at more than five million birds. Compare this to the other populations of lesser snow geese that winter in the Central and Pacific Flyways; that combined number is about half million birds. Biologists estimate the mid-continent population has increased by three to five percent per year and has more than tripled in the last 30 years. What are the reasons for this dramatic increase? It appears that a change in migratory and wintering habitat over the past three to four decades is largely responsible. Degradation of the coastal marshes in Louisiana and Texas from subsidence and saltwater intrusion along with expanded agriculture, principally to rice culture, have lured birds away from the coast to inland areas where waste grain is abundant. Along their migratory path, agriculture in the form of corn, wheat, soybeans and rice as well as a string of sanctuaries and wildlife refuges from the Canadian prairies all the way to the Gulf have provided abundant food resources and secure resting areas. As a result, both the fall and spring migrations are more leisurely and the birds actually increase their body weight by up to 25 percent during the slow northward movement in the spring. Once the geese reach the breeding grounds in May they concentrate as they wait for the snow and ice to melt. It is in the early spring that snow geese overgraze the fragile salt marshes of the Hudson Bay lowlands. Snow geese have always consumed salt marsh plants on the breeding grounds. However, historically populations were much smaller and the amount of foraging was in balance with these tundra environments. Today, huge numbers of snow geese have overwhelmed the vegetation on the spring staging areas and breeding grounds to a point it will take many years for these slow growing plants to replace themselves. Biologists estimate that up to 35 percent of the salt marsh habitat along more than 1,000 miles of Hudson Bay has been negatively impacted or destroyed. At the most studied location in Wapusk National Park at La Perosue Bay in Manitoba, up to 90 percent of the salt marshes have been destroyed. The damage in these areas is severe enough that once the goslings hatch, the parents must take them on a long overland march many miles from the nesting colonies to find food. Additionally, other species of wildlife including several species of ducks, shorebirds and other birds have declined in these areas. Continued -- click on link below. It was in Wapusk National Park, only a few air miles from Churchill, Manitoba, that my Arctic snow goose odyssey began. My goal was to photograph nesting snow geese and their broods. Therefore, I arranged my trip for the third week of June to coincide with the peak of the hatch. I flew to Winnipeg, then to Churchill and transferred by helicopter to the Nestor Two research station at La Perosue Bay. The arrangements were made with the director of the project, Robert "Rocky" Rockwell and I obtained a permit from the Canadian Park Service. The flight lasted only 20 minutes and as the chopper hovered to land at Nestor 2, I noticed a man heading toward the landing zone. The chopper landed and I exited the chopper. In the nearly deafening noise of the chopper, the man introduced himself as Rocky Rockwell. With little fanfare, he told me a polar bear had breached the electric wire surrounding the camp and had broken into one of the cabins. He further explained that while their research was to continue, it was possible only because the biologists worked in teams--one person does the work while a second person armed with a shotgun stands guard. Because he did not have anyone to accompany me in the field, going it alone would be too dangerous. As a result, he arranged for me to go to Nestor 1 where so far there had been no polar bear sightings. My immediate reaction was disappointment because the major snow goose nesting colony was at Nestor 2. So with little recourse, I re-boarded the helicopter for the 10-minute flight to Nestor 1.
ed several additional broods and by day four there were literally hundreds of adults leading broods of three to five young across the tundra. What I was seeing was a mass exodus of snow geese from their primary breeding area at Nestor 2. Due to the lack of forage near Nestor 2, the adults moved their young several miles to Nestor 1 and beyond where the forage was better. At times there were literally dozens of broods visible in every direction. The movement reminded me of caribou moving across the tundra. It didn't take long for me to notice a pattern. The adults took the path of least resistance crossing the larger bodies of water at narrows where the distance the goslings were required to swim was minimal. I built a makeshift blind at one of these narrows and for the next three days photographed brood after brood of snow geese. I was at Nestor 1 for eight days and photographed snow geese and their broods every day. I also photographed Canada geese, Old Squaw, greater scaup, tundra swans, caribou, arctic fox and a variety of shorebirds. By the end of the trip, I exposed more than 50 rolls of film and accomplished my goal. The hunting portion of my snow goose odyssey took place last September during a four-day trip to Kaska Goose Lodge, as described in the opening paragraphs. After spending time with these unique birds, it seemed fitting to hunt them as close to the breeding grounds as possible. And that is exactly what I did at Kaska. In fact, I may have seen some of the very birds I watched walk across the tundra as goslings. Each fall, beginning in mid August, snow geese along with some Canada and Ross's geese gather on the western shore of Hudson Bay where they stage before their long journey south along the Mississippi Flyway. Birds from the central Arctic breeding grounds and La Perouse Bay heading south and birds moving up the coast from James Bay converge in the vicinity of the Kaskattama Delta. Each year between mid August and late September the birds stop here to feed on sedges and grasses that grow along the water courses and wild berries in the uplands. The second morning at Kaska dawned bright and clear and not five minutes after the decoys were set Carl spotted snow geese on the horizon. As the birds winged closer, I turned on the electronic call. Electronic calls are available and if they are used you cannot have blue goose or Canada goose decoys in the spread but you can still shoot both white geese (snows and Ross's) and Canada geese. We tried it with and without dark geese in the spread and with both electronic and mouth-blown calls and did best with all-white goose decoy spreads and the electronic call. Hearing the chatter produced by the electronic call, the birds quickened their pace and when they saw the look-alike impostors already on the ground feeding they were committed. When still two hundred yards out, the clamoring flock began a slow glide toward the decoys. Lying in the decoys, I watched the geese descend over the edge of the spread. As they winged closer, I could see that about 60 percent of the flock was blues and the remainder was white birds. They seemed to hang in the wind looking for the right place to land. When the center of the small flock was 25 yards out, I gave Carl a nod and we sat up to shoot. I snapped the over and under to my shoulder and instinctively pointed at the chest of a goose overhead and pulled the trigger. The bird folded in a puff of feathers even before I felt the recoil against my shoulder. It hit the ground with a serious thump. My peripheral vision caught another goose falling from the sky and the report of shotgun blasts rang across the tundra. I picked a second bird that was scrambling for altitude, pointed the barrel at the bird and fired. We managed to drop three geese--all blues including one white-headed adult or "eagle head." We settled back into the decoys just in time for another flock to appear. However, behind the second flock was another and another. It seemed that suddenly the air was filled with geese--in medium size flocks and small family groups. The next flock was still well outside of the decoys but locked-up and coming in. They came straight in and two birds landed in the decoys while a dozen more circled overhead. After what seemed like several minutes, but was probably only seconds, Carl gave the nod. I picked the closest bird, swung on the target and missed. I couldn't believe I missed a bird that was settling in to land and only 20 yards out--but I did! I regained my composure, pulled the trigger a second time and the bird folded. I looked over at Carl and the first thing he said was "nice shot." Then I asked where his bird was. His reply surprised me--"I didn't even fire, I just watched the show." The day continued at a steady pace and by the time the flight subsided at 1:00 p.m. we had 15 to 20 birds each. It was a day to remember! A major factor in determining hunting success for snow geese is the percentage of juveniles in the population. During our September hunt at Kaska, 50 to 60 percent of the birds were the young of the year. In years when the proportion of juveniles is high, shooting is generally good. In contrast, if the number of juveniles is low, hunting success suffers. It seems that the inexperienced young birds affect the behavior of the whole flock. Not only are the juveniles more vulnerable to the gun, they will bring adult birds to the decoys. In 2005 and 2006, mid-continent snow goose breeding success was good resulting in a high percentage of juveniles in the population. And because we were hunting snow geese very close to the breeding grounds, the decoy spread that attracted them was likely the first decoys they had ever seen. At Kaska we used electronic calls and the limit was 20 snow geese daily. These liberalized regulations were adopted in the late 1990s in response to the growing population of mid-continent snow geese. In 1997, a group of wildlife agency administrators, wildlife biologists, university scientists and conservationists prepared a formal report that recommended the mid-continent population be reduced by 50 percent. The working group reported the only practical way to achieve the reduction was by hunting. To meet the goals, a number of regulation changes were instituted for white geese only. 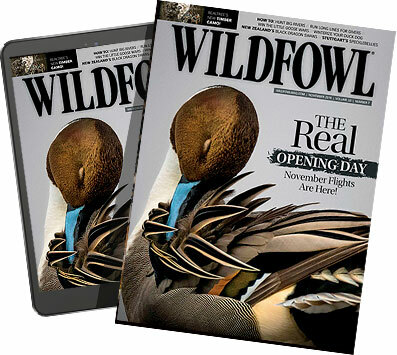 They included the use of electronic calls, extended spring seasons beyond the March 10 closure mandated by the Migratory Bird Treaty Act, allow the use of unplugged shotguns and significantly increase bag and possession limits. Now that these liberalizations have been in effect for nearly a decade, have they been effective? The short answer is yes, and the liberalized regulations have helped to reduce the excessive numbers to more manageable levels. My next snow goose hunt is in Texas. The Texas trip will take me to the opposite end of the flyway and will close the book on a fascinating quest that began on the tundra of the Hudson Bay lowlands a few months earlier and several thousand miles away. It's hard to imagine that snow geese do it every year!